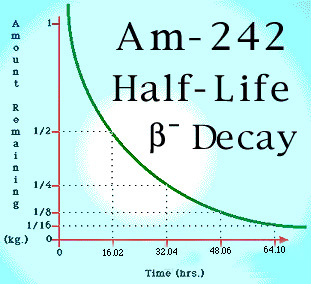 Below is a graph showing the half life of the isotope, Americium-241. Note that in theory, some of the original substance will always remain as the amount of substance only reaches zero as time approaches infinity. Cesium-137 is a radioactive element with a half-life of thirty years. Its decay results in the formation of Ba-137 with a very short half-life. Both elements have the same atomic mass but cesium has an atomic number of 55 and barium has an atomic number of 56. Because they are different elements, they have different chemical properties and can be separated by chemical processes. This experiment uses a glass isogenerator and a 9.0 pH specific chemical solution called EDTA. The EDTA at 9.0 pH will react chemically with the radioactive daughter element Ba-137 and not with the parent element. The cesium stays in the isogenerator and the radioactive barium is allowed to flow down the tube. If the pH of the EDTA is greater than 9.0, the possibility of Cs bleeding through is greater. And if the pH of EDTA is allowed to fall below 9.0, the Ba will come out of the isogenerator more slowly. The chemical decay of Cs-137 is a two step process. First, a neutron inside the 137Cs nucleus undergoes beta decay which converts the neutron into a proton and a beta particle (electron) and a neutrino. The 137Ba nucleus produced by this process is left in an excited state, 662 keV above the ground state. When this level decays, a 662 keV gamma ray is emitted. It is at this state that you will determine the half-life of 137Bam. (Note: the "m" state stands for metastable). Finally, 137Bam becomes stable with a mass of 137, with 56 protons, and 81 neutrons. To determine the half-life of Barium-137. Part A (It is suggested that the teacher prepare steps 1-3 before class). The first step of preparation is to remove the large cap above the reservoir. This may be difficult, due to the vacuum created in the column itself. This should be done by holding the column secure in one hand and using the thumb to push in an upward motion. Do this slowly to keep the liquid inside the column. Once this has been accomplished, place the column in the burette clamp and mount on the ring stand. With gloves on and a vial under the column, remove the small cap at the bottom of the column. Catch the liquid and determine with the Geiger counter that there is no contamination present. At this point, replace the small cap with the stopcock provided. Make sure the stopcock is in the off position. Fill the column with 3 ml of 0.1M EDTA (pH 9.0). Allow the column to sit for approximately one hour. This moves the cesium down the column, allowing better results on your first "Milking the Cow." This procedure is very pH specific and could influence the results of your experiments. It is suggested that the pH of the EDTA solution be checked often. Also, the solution should be replaced every six months. Remove the top cap from the column. Write down the ml value for the level of EDTA by reading it from the top of the column. Prepare your glass vial to catch the eluant. Place this directly under the column, adjusting the height of the column to be no more that two inches above the container. For more safety protection, place the vial in a zip lock bag and seal it. Turn the stopcock to the "on" position. Allow for about twenty drops of the eluant to flow into the container. No more than three ml is needed. Turn the stopcock off immediately after the correct amount of eluant has flowed through. Turn on the Geiger counter and record the background radiation. Set the Geiger counter with the scale to x10, and place it next to the sample. Record readings in table 6.1 every thirty seconds for the next five minutes. Change the scale setting to x1 and repeat step five. Fill the column again with EDTA eluant to at least the 5 ml mark. If the cow is to be milked again, it is necessary to wait an ample amount of time to ensure the daughter has been allowed to grow in and the recovery is good. (A good guideline is fifteen to thirty minutes). If the column is not to be used within a week's time period, it is necessary to bleed all of the EDTA out and place deionized water back in the column for long term storage. The cap should also be placed on the column as securely as possible. Remember this is an ionization exchange column, and it must never be allowed to go dry. For long term storage, it is best to store in distilled water and as air tight as possible. Make a graph of the cpm vs. time. Compute your uncertainty square root average. Draw the curve of best fit. What is the half-life of Cesium-137? What is the half-life of 137Bam? What type of decay is Cesium undergoing? Why is this a two step operation to produce stable Barium-137? List the most important safety steps taken to prevent radiation. Compute your percent error by comparing the value you obtained by the graph and by the calculation with the accepted value of the half-life of 137Bam.